The Saudi Spine Society (SSS) is a non-profit multidisciplinary professional society established in September 2015 with the mission to promote excellence of spine care. One of the strategic objectives to achieve this mission is through promoting high quality research in the field of spine care. For the second year, the Society is providing research funding opportunities to support its members who are interested in conducting research. The program aims at providing seeds funding for members of SSS to facilitate their research projects. The program is run by the SSS Research Committee and mini-grants are offered annually. The awarded researcher will have the opportunity for poster presentation of their research proposal/idea during the Society’s annual meeting held in November of the same year their award. The final report of their research must be presented during the Society’s Annual meeting the following year. The applicant should not have another source of funding for the same research project. The research proposal must be in a relevant field of spinal care. The research proposal must be approved by a recognized Institutional Review Board/Research Ethics Committee (IRB/REC) prior to submission. The research project must be new or ongoing. Completed research projects are not eligible for the grant. The applicant must submit the research proposal using the designated application form (Mini-grant application form 2019). The applicant must provide a detailed budget. The funding will not cover investigator’s’ salary, travel, or consultations. The budget should not exceed an amount of SR 20,000. All applications must be written in English language and submitted before the announced deadline. 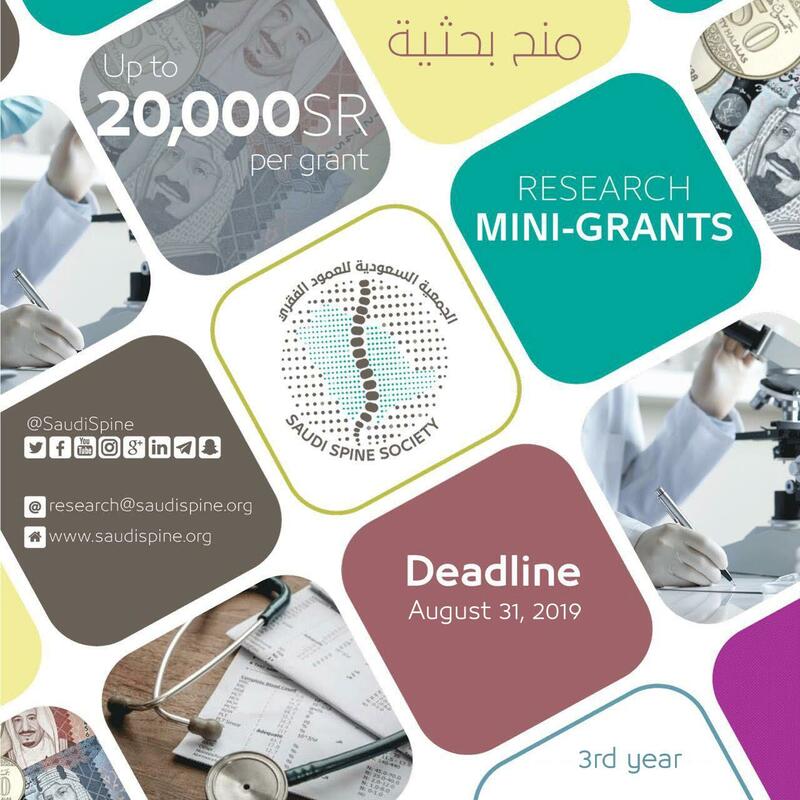 The investigators must include this statement “This research was funded by the Saudi Spine Society Mini-Grants Program” in any form of publication (podium, poster, and paper; electronic or printed) of their research, in case they were granted funding. All applications must be received by the SSS Research Committee (research@saudispine.org) prior to August 31, 2019 for initial review. The proposal will be subjected to plagiarism check using one of the available softwares. Investigators with proposals with plagiarism of more than 30% will be disqualified from application for two consequent years. The eligible proposals will be reviewed by 2 blinded independent reviewers. An evaluation form will be completed by reviewers, and the criteria include: a. The significance of the proposed study. b. The investigators’ ability to conduct research. c. Originality and innovation of the proposed research. d. The soundness of the methodology. e. Detailed and justifiable budget. f. Ethical approval g. Research timeframe should not exceed 12 months. The final decision will be made by the SSS Research Committee and communicated by email to all applicants by October 31, 2019. Appeals against the Research Committee decision can be directed to the Society’s President (president@saudispine.org) prior to November 14, 2019. The principal investigators of the approved applications will be contacted via email by SSS Research Committee. A contract will be signed by the Chairperson of SSS Research Committee and the principal investigator. The principal investigator will receive 25% of the approved grant money immediately after signing the contract. 25% following a 6-month progress report, and the remaining on completion. A copy of any form of publication from approved research must be submitted to the Research Committee (research@saudispine.org).